My day started earlier than usual because I had to get up, get en femme, and drive to the other end of the state by 10 AM to attend Avon's "Come Home for the Holidays 2011" show. 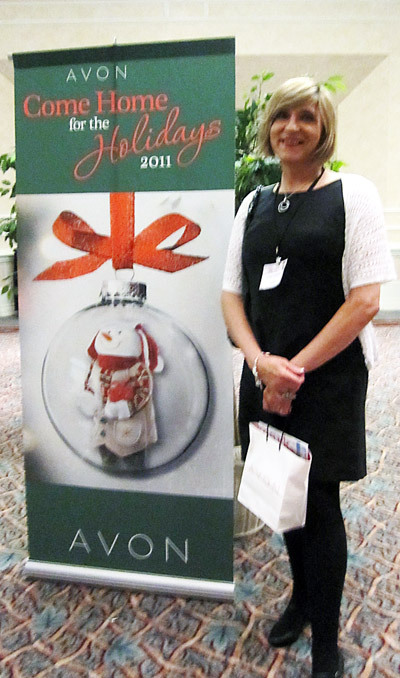 The show was attended to acquaint us Avon representatives with new products to sell during the holidays. Besides the opportunity to see the new products and hobnob with the other Avon ladies, a $50 gift bag awaited each attendee. How could I resist? The show took place at the Foxwoods casino, the biggest casino in the USA. Problem is that you can't get there from here. It is only 70 miles away, but the route is so convoluted that it takes 90 minutes over some bad roads to get there. I was on the road at 8:20 and the weather was terrible. The Northeast was being deluged again, flash floods and traffic accidents here and there throughout the state, Noah was gathering wood... not ideal driving under the gun conditions, but I managed to pull into a Foxwoods parking garage at 10 AM on the dot. I wore my mid-heel Mary Janes, a very comfortable shoe, probably my most comfortable shoe. It occasionally shows up at Payless for sale. When I bought the shoe, the salesman said that it sells out quickly because of its reputation as being comfortable, yet it is a nice-looking shoe. Anyway, I needed the comfort because now I had to sprint to the other side of the casino. The casino is very big and I had to walk about one-third of a mile to get from my parked car to the site of the show, the Grand Pequot Ballroom. I arrived at the Ballroom at about 10:15 along with a huge throng of other Avon representatives. Turns out that they opened the doors at 10 AM, but that the show was continuous all morning long. There was no need to be there at 10 AM on the dot, so I did not have to hurry to get there. C'est la vie. I joined the throng, which was about 99% female and 1% male and probably 75% of the males were with their spouses, so I assume the wife in these couples was the Avon rep and the male was their supportive husband. Just about everyone I encountered treated me nicely... as if I belonged. I only noticed one or two in the huge crowd that might have had some transphobia, but that is only my take on them --- they just might have been having a bad day or they could not handle crowds. As far as I can tell, I was just one of the girls. I chatted with a few and everyone I asked, graciously took my photo. I must have made a positive impression because whenever I encountered someone I had chatted with earlier, they acknowledged me with a wave and a smile. One woman said that she loved my dress (she was also wearing a dress). I'd estimate that about 10% of the women wore dresses or skirts; the rest wore slacks, but almost all the outfits would be considered "business casual" garb. By the way, I was not the tallest woman in attendance. I counted three that were as tall, if not taller than me. And there were perhaps a dozen six-footers in the crowd. This was the first time I had the opportunity to get up close to my manager and she is tall, too. 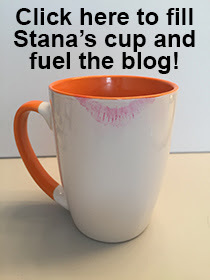 I saw a couple of items that I will definitely order for myself (for myself or as gifts). After 90 minutes, I repaired to the ladies' room to fix my makeup, then I proceeded to the various casinos in the complex to try my luck at the slot machines. I usually play 25-cent slot machines and I had to search for them because it seems that the penny slot machines are taking over. The first quarter machine I played, I walked away up $20. That was an auspicious start. The second machine I played, I won 600 quarters ($150) on the third spin! It occurred to me that whenever I play the slots en femme, I am always successful --- maybe the gods are trying to tell me something. After that, I held my own and managed to walk away $180 ahead at day's end. Nice! I exited the casino at 2:30 PM headed for home. The weather had cleared and the drive way pleasant and my mind wandered trying to think of any stores to visit before returning home. There is a DSW Shoe Warehouse along the way, so I decided to do some shoe shopping. I parked my car and checked my makeup. Yuck! A 5 o'clock shadow at 3 o'clock! In my rush to get going in the morning, I obviously had not shaved as well as I should have. Normally, a close shave would be good well into the evening, but not today. I tried to cover the stubble with my powder foundation to no avail. No one would likely notice, but I lost my confidence and decided to abandon shoe shopping and go home. Despite that, I had a wonderful day out en femme. I was a tired by the time I exited girl mode, physically tired, not tired of being en femme. I will never tire of being the woman that I really am. Speaking of shoes, last week I met your friend from the CABO reception. I didn't have time to say "Hi". She never answered my e-mail about where I bought my shoes, so I dunno! I have the same shoes from Payless, one of my favourites, so comfortable. I could wear all day and have. Anonymous --- Thank you for the spelling correction. My editor was out getting his legs waxed and I was in a hurry to publish the post, so I did so without him looking it over. I really don't care about the literal translation of "en femme." We transgenders have given it a new meaning and that's where my interest lies. Frenchperson cannot spell Americans right, so boring! 'Anonymous' is clearly not merely extremely rude but also not in fact a native speaker of French. 'S'habiller en femme' is authentic French, just as 's'habiller en soldat' is. For some reason, I'm reminded of this quote from Professor Henry Higgins "The French don't care what they do actually, as long as they pronounce it properly." The literal en Francais is "habillé en femme" (dressed as a woman) Since "habillé" is unknown in English (and the exact pronunciation is unknown for a non-francophone), "en femme" gets the meaning across just as well.